“Woody” and his mate used to live in the Leylandi trees at the back of the garden. Last year however, the trees went and he was forced to move next door but one. Don’t think he bears a grudge though as he often drops in to say hello and aggravate the dogs. Quite tricky to get a shot off as he moves about quickly – it’s also very gloomy out there at this time of the year. Was pleased with this attempt, especially as the patio doors haven’t been cleaned for weeks. The Sigma 70-300 is definitelty out performing the old Tamron in pretty much every area at the moment. Two words that no matter what, always make me smile like a naughty schoolboy. Absolutely no idea why, but it just does. 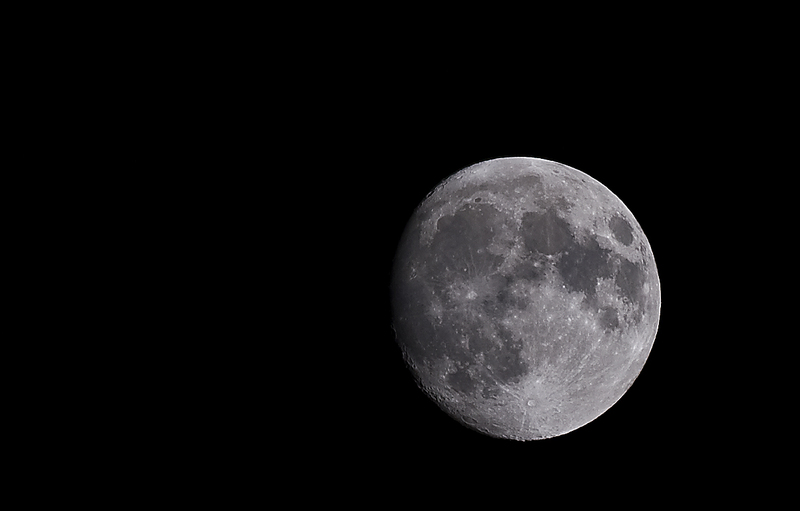 As the old lens died whilst attempting a moon shot, I thought I’d test the new one on the same subject. I have to say that I’ve been impressed with the image quality of this sub ¬£100 lens for the football photos with little or no chromatic abberation which was sometimes a problem with the Tamron. Was quite pleased with the result of the moon as well – Detail is pretty good for a cheapy lens, and unless you’re pixel peeping it’s generally an acceptable image. This is a pretty heavy crop (not quite 100%) of the full photo, and as had a contrast boost and a little unsharp mask added prior to uploading. Not sure why, but seem to have become slightly obsessive about reflections recently. Haven’t touched the camera for over a week and cabin fever has not irreversibly set in. Been meaning to hve a crack at these things since the storm in a teacup shot (see my Flickr stream) to try and capture some clouds etc. reflected in the water. for the last two weeks the skies have been a monotonous grey, so as the sun attempted to shine this afternoon I felt obliged to have a go at this. Regrettably, my cd tray only had this knackered old thing in (it’s got more scratches than a cat’s scratching post) and I didn’t get the tripod out, but went OK from a test perspective. For those that care, this was taken hand-held, with the Canon 50mm f1.8 plus 36mm kenko extension tube. Daily Mail – Don’t Panic, there are still some things not on the list……. OK, so it’s got absolutely nothing to do with photography, at all, except for the fact that Digital Cameras don’t currently seem to pose a health threat (yet). You’ve got to love the Daily Mail – What other UK newspaper would care so much about it’s loyal readers that they’d bend over backwards to warn you about all of the things that might be bad for you !! Thank heavens that smoking isn’t as bad as this lot, or I’d really be in trouble. Without further ado, the unabridged (but probably not yet complete) Daily Mail list of things that will give you cancer. Not everybody finds it.¬† Some people find it and lose it, some people find it and throw it away.¬† Ultimately, Love is a gamble.